How much does Dredging cost? How much does dredging cost is the most commonly asked question for many lake associations. We sat down with Dan McDougal, President of Dredge America and asked him that question. How much material is there to dredge? Where can you put the material that is coming out of the lake? What is the nature of the material to be dredged? In order to determine a quantity, the first thing that is required is to perform a pre-dredge hydrographic survey (bathymetry). This type of survey will provide water depth information throughout the entire body of water. At the same time a sediment survey can be performed providing soft sediment thickness information. It is money well spent at this stage to hire an experienced hydrographic surveyor with proper insurance and credentials. This will help protect the association if there is ever a dispute. The hyrdrographer will be able to give a general description for the soil characteristics and perform the sub-bottom profiling all in one site visit. With this information, you can make an informed decision about how much more data is needed in order to get the most cost effective proposal for your dredging project. After you have quantified how much sediment needs to be removed, the next step is to find a place to put it. Most people underestimate the amount of space they need to place and contain the sediment that comes out of the lake. The size of area you will need will depend on many factors with the number one being the lay of the land. Usually for every two acres of lake that you dredge, an average of three foot of sediment, you will need an acre of upland area to place the material. This will yield an average elevation increase of six feet on land prior to consolidation. The closer this area to the lake, the cheaper the dredging costs will be with all other things being equal. The final question to answer is the material characteristics. In most lakes, what is being dredged is often referred to as “muck.” This is generally a combination of silt, clay, and organics. There is also sometimes sand in the very end of the coves. The dredger needs to know this as sand is more costly to pump further, but easier to dewater; while muck pumps easy, but can be costly to dewater, particularly if the disposal area size is limited. Hard packed sand, or hard pan clay bottom, are more difficult to cut, and therefore more expensive. Rock is even more expensive and most often cost prohibitive. There should be a clear distinction if the dredger is expected to only remove sediment that has filled the lake since it was originally constructed, verses cut virgin ground that has never been excavated. It is best to work with someone with many years of dredging experience to help guide you through the maze and advise you on what is needed, not needed, and what options you can elect for the associated costs. In the end, you want someone you can trust with a long history and who can supply you with pages of references. The very last thing you want is someone to learn about dredging on your project and on your dime. So is your project feasible? If you can’t afford to have someone qualified come out and perform a hydrographic survey, the answer is no. If you can do this, then you can have a quantity and a three dimensional image of your lake bottom. With this critical information you can communicate with your neighbors on what the problem is, where it is, and a ballpark of what it might cost to fix it. One final thing to consider is that all lake associations have more mud than money. With the hydrographic survey, you can set your priorities based on a realistic budget that your association is willing to spend. You and all of your neighbors live on a lake for a reason. It is a lifestyle. Your lake has to be maintained just like your roads and your sewers. To ignore it, is to ignore the largest asset in your community. Property values go down or up based on the quality of the lake. or call him 800.464.5597. You can also visit their website for more information. 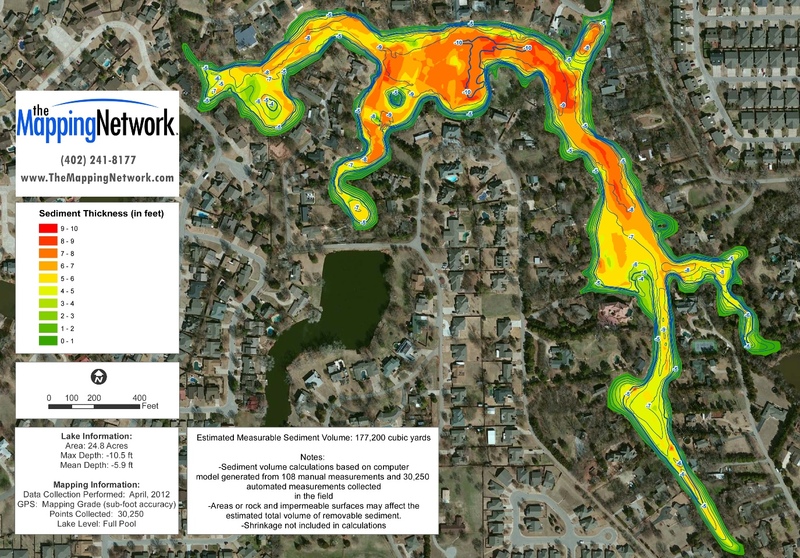 The Mapping Network surveyed the bottom of the lake including the sediment depths. This map shows the lake water depth as blue contours lines as well as a color shaded sediment thickness. This specialized technology allows the POA to easily locate problem areas. This entry was posted in Sediment and tagged dredge cost, dredging a lake, dredging a pond, dredging price, hydrographic survey, predredge survey, sediment map, Sediment Quantity Analysis, sediment removal cost, sediment survey on January 28, 2014 by Moderator.